You May Understand the “Plumbing”, But do you Have a Sound Cloud Strategy to Benefit Your Business? Is a cloud strategy right for your business? If so, when? It likely depends on the state of your business and your IT environment. 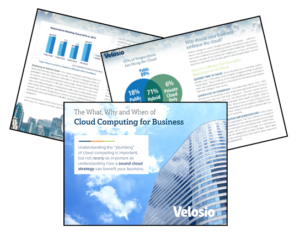 In this paper, we’ll explore the decision-process as it relates to cloud computing software and shed light on-premise vs. cloud solutions and moving to the cloud for those of you considering technology changes in the next one to two years. Technology decisions today are more than technology decisions. Learn about the economics of migrating to the cloud. Resource management, business agility, flexibility for growth, operational costs, financial accounting and company valuation are all considerations that will be explored.